Chet Nichols looked back on his then-brief major league career to The Associated Press in 1953 and zeroed in on one game as his biggest thrill. Nichols, who played one season with the Boston Braves before joining the Army, recalled striking out Andy Pafko to lock down a win against Brooklyn. "Striking out Pafko - that was my biggest thrill," Nichols told The AP. 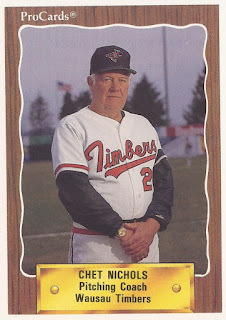 Nichols eventually had much more to look back on for his major league career. After getting out of the military, Nichols went on to see time in eight more major league seasons. He also spent a brief time as a minor league coach. Nichols' career in baseball began in 1948, signed by the Braves as a free agent out of East High School in Pawtucket, R.I. His father, also Chet Nichols, also played in the majors. Nichols went through Class B Evansville in 1949, then AAA Milwaukee in 1950. He then made Boston in 1951. With the Braves, Nichols went 11-8 over 33 outings, 19 starts. His ERA ended at league-best 2.88. Nichols came in second in the Rookie of the Year balloting to Willie Mays. He then joined the Army during the Korean War. He came back to resume his career, but his shoulder wasn't right. He went 9-11 for the Milwaukee Braves in 1954, with a 4.41 ERA, then 9-8, with a 4.00 ERA in 1955. His 1956 season consisted of just two outings. Though his shoulder bothered him, Nichols kept it quiet, he told The Milwaukee Sentinel going into 1957. "I wanted to make a good impression, what with the club depending on me so much after the Johnny Antonelli deal," Nichols told The Sentinel. "So I tried to throw real hard and it could be that I strained my arm during spring training." Nichols then spent three years in the minors. He also spent time as a bank teller. But he kept going and he returned to the bigs in 1960, with Boston. He played four seasons with the Red Sox, getting into as many as 29 games in a season. "I'm glad I've had this chance to pitch again," Nichols told The AP in August 1961. "You only have a few years to make money in baseball and the only place you can make good money is in the majors." Nichols' final time in the majors came in 1964, with three outings for the Reds. Nichols then returned home and went back to banking. He later returned to baseball as an instructor for the Red Sox and coach in the Orioles system. He served as pitching coach at single-A Wausau in 1990. Nichols passed away from cancer in 1995 at the age of 64.